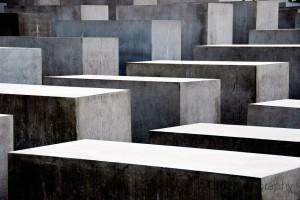 Berlin, Germany is a dynamic, artistic city that has shed, but not forgotten, its tragic past. 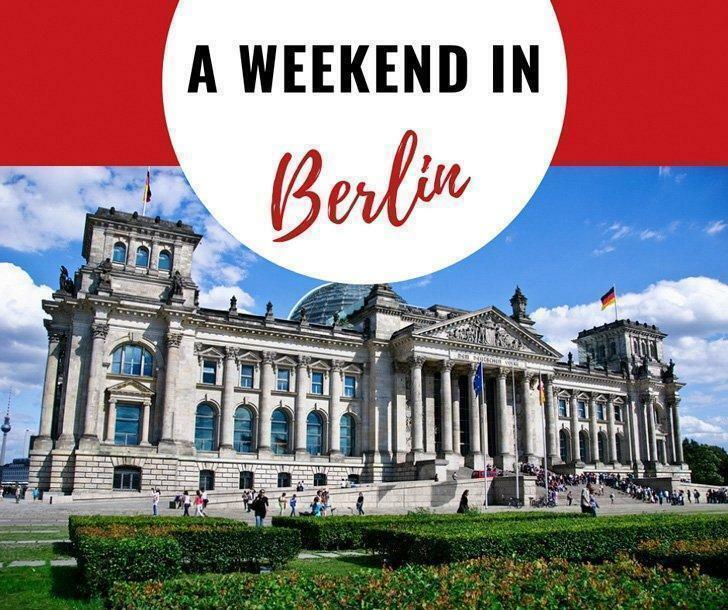 We share how to spend a weekend in Berlin with plenty of things to do and see in this fascinating city. Remember last summer when Andrew and I made that whirlwind trip to Berlin, Germany? Yeah, I almost didn’t either. Sure enough though, as I caught up on my photo editing, there were the photos from Berlin – evidence of a great weekend I had almost forgotten to mention here on CheeseWeb. I’ll be honest and say I didn’t have a burning desire to go to Berlin. But the great thing about being open to travel just about anywhere is you discover places that surprise you. As a matter of fact, we ended up in Berlin to deliver wine to friends who were on a grand tour of Europe, and we have them to thank for our fabulous weekend. We arrived in Berlin early Friday morning and took the U-Bahn (German underground rail) to our hotel. As you would expect, the U-Bahn was a clean and efficient way to get around the city. Our Hotel was a block away from Checkpoint Charlie, and the Mauer Museum was our first stop. On the 14th of June 1963, the “Haus am Checkpoint Charlie” opened beside the famous crossing. It was the creation of one man, Rainer Hildebrandt, the founder and director of the museum until his death in 2004. 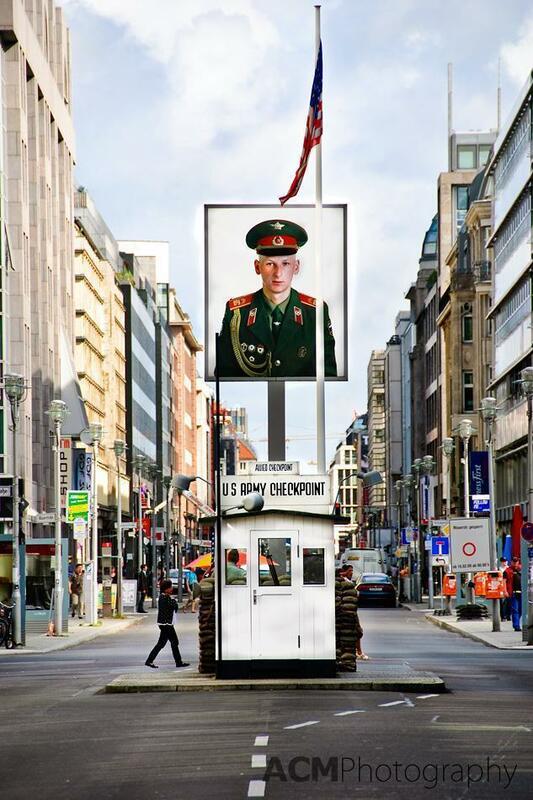 The museum contains documents, photos and artifacts from Checkpoint Charlie. Most interestingly it illustrates the many means that were used to escape East Berlin, some successfully, some with tragic consequences. No visit to Berlin is complete without exploring the remains of the Wall. Its legacy is marked in several ways. Portions of the Berlin Wall still stand in various locations. The Wall’s perimeter is marked on the ground with paving stones and small metal plaques. Just about anywhere you go, you can buy random bits of painted concrete that claim to be from the Berlin Wall. Or, you can scour the ground near the remains, like us, and find your own bit of history. 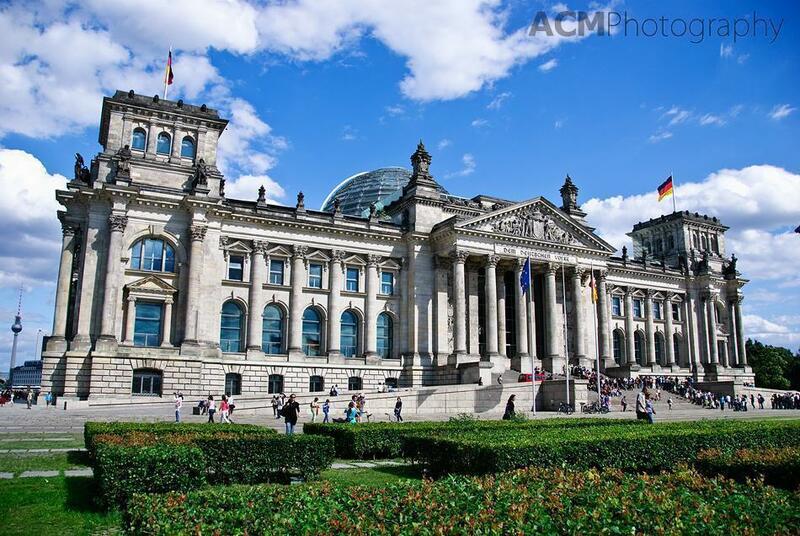 Within sight of the Holocaust Memorial are two of Berlin’s most famous historic buildings: The Brandenburg Gate, the former entrance to the city, and The Reichstag, the German Parliament building. In front of the Brandenburg Gate, you can catch one of Berlin’s many tourist buses, which is exactly what we did. The tourist bus gives a good overview of the city, stopping at most of the important sites. 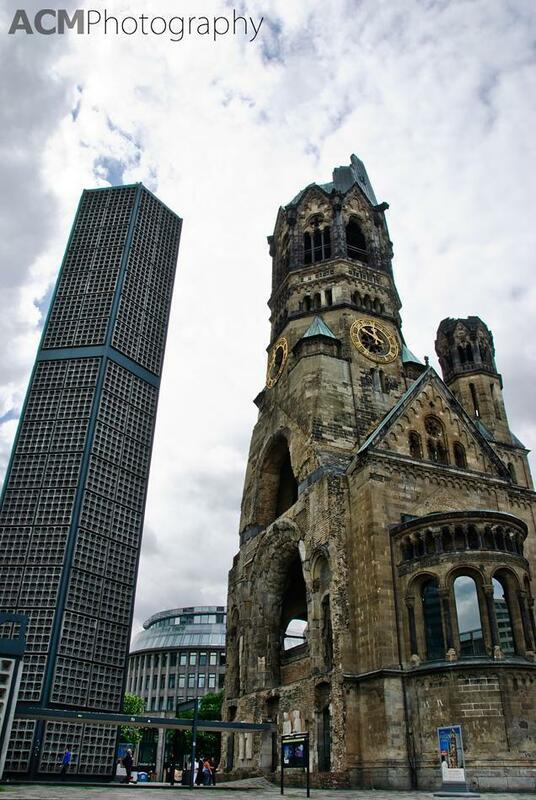 One interesting stop was the Kaiser Wilhelm Memorial Church. This church was nearly destroyed in a bombing raid in 1943. A new church was built between 1959 and 1963 in a controversial modern design. It is sometimes referred to as the “Lippenstift und Puderdose” (lipstick and powder box) because of its cylindrical shape. The interior of the modern church is stunning, however, as the light filters through a concrete honeycomb containing 21,292 stained glass inlays. No trip is perfect for me without good food and drink. Berlin was a huge surprise for me in this department. Although Andrew and I enjoyed the traditional Berlin meal of beer and currywurst, we had several fantastic meals in the Gendarmenmarkt. One of my favourites was at Restaurant Aigner, famous for their hearty beef soups. If you visit Berlin in the summer, like we did, I highly recommend having a drink or eating your entire meal al fresco in this beautiful square. We ended our weekend visit with a boat trip on the Spree on Sunday. It was a relaxing way to enjoy Berlin’s stunning architecture – both old and new. Although I had no desire to visit Berlin before my trip, I now can’t wait to return and spend some time exploring some of the many museums that we just didn’t have time to see. I would certainly recommend Berlin as a great city-break destination in Europe. If you want to see more of Berlin, check out my Berlin Photo Gallery. 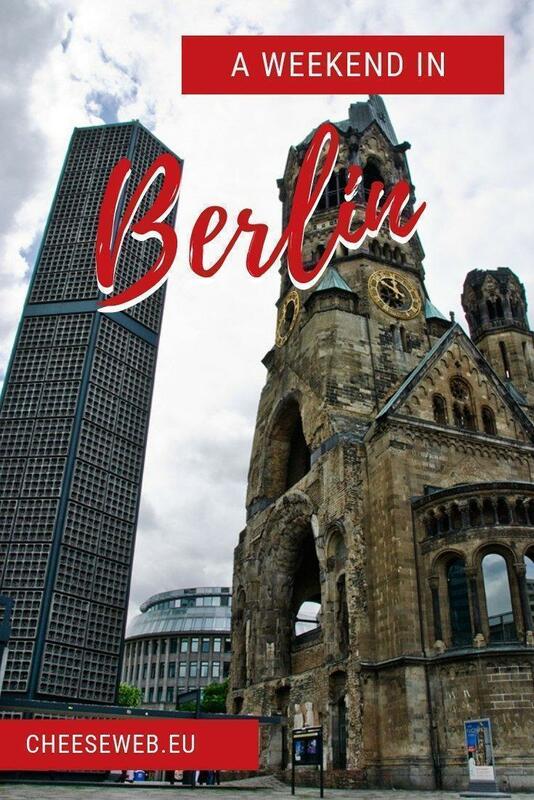 If you’ve been to Berlin, I’d love to hear what you thought of it.